Purple Glitter Princess Pin You can order this pin for your event in quanitities of 50 or more. This pin is not in stock and will be ordered in for you. Please note- it can take up to 4 weeks to get this pin. 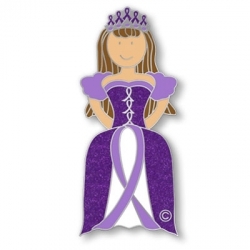 This pin can be brought in in any cancer awareness color. Contact Courtney at czinszer@yahoo.com for more information.